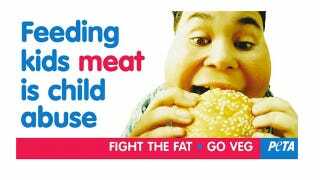 Clearly unsatisfied the offensiveness level of its previous campaigns, PETA has kicked things up a notch with a billboard stating "Feeding kids meat is child abuse." Meat can help make kids fat and sick. In addition to facing the social challenges caused by childhood obesity — which can lead to lifelong psychological trauma — children who are fed a diet of burgers, chicken nuggets, hot dogs, and other foods that are laden with saturated fat and cholesterol have their health put at risk. That's right, everyone — if you let your kids eat meat (which obviously means you are stuffing them with McDonald's 24/7) you are condemning them to "lifelong psychological trauma!" Of course, there's no mention of the fact that a lot of this trauma comes from fat-stigma caused by, among other groups, PETA, which also once ran a billboard telling people to "Lose the blubber: go vegetarian." There are many great reasons to stop eating meat, but getting skinny isn't one of them. And no matter what you think about food politics, feeding your kids meat is not child abuse.